Search for your account or other players. Sign in to track your lifetime stats, recent matches, and more. Detailed statistics for the current season and your lifetime of PUBG. Get detailed data about your wins, kills, combat skills, survival skills and recent matches. Everything is in your browser and available on any device. In your season and lifetime statistics you can find your recent matches for a single game mode. Get a quick snapshot of how you're playing then dive down into match reports for even more detail. Get in-depth information about individual PUBG matches. Find out what your most used weapon was, how much damage you did, leaderboards, kill trees and more. More PUBG stats than you can handle. Here's a quick list of some of PUBG Lookup's features. Check out the features page for more. Stay on top of season stats for you and your squad. We pull statistics straight from the PUBG servers so you know you're looking at current information. Get a preview of up to 30 of your most recent matches. Keep track of your stats while you're playing or watching your favorite streamer. Matches are updated as chicken dinners are delivered. Statistics and details on specific matches help you refine your game. Damage hit region charts, damage caused and received details, and overall details help you pinpoint areas of your game to work on. Share your match with your friends to prove you won. As a registered member you won't see ads. PUBG Lookup is developed and maintained by one person (hi!). Ad revenue helps pay for the servers and bills. As a registered member you have the option to enable ads, but you won't see them by default. Want to know where your bullets are going over multiple matches? Get information like damage per region, hits per region, kills per weapon, and more with graphs and a clean layout. 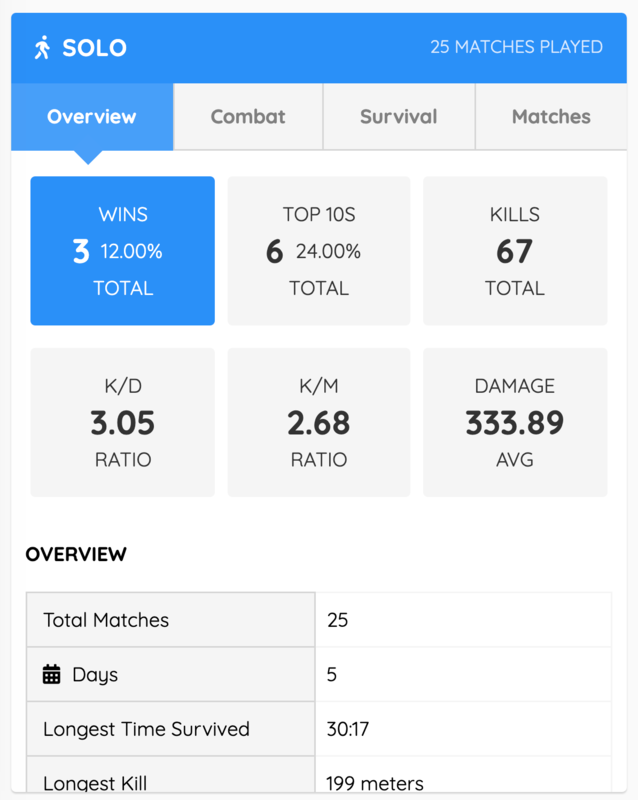 Not only can you get the current season's statistics but we compile all of your seasons together to give you metrics on your lifetime stats in PUBG. Compare your lifetime stats to your current season to see how you're improving. Want to know what region you did the most damage to in a single match? Ever wondered exactly how much damage an exchange did to a player? Now you can see detailed views of your match damage. We take all of the match data to produce a visual "kill tree" to show you how many kills you got and how it is intertwined with the rest of the match. If you got the last kill, you'll be on top... eating chicken. Do you play with the same players often? Do you follow streamers on Twitch and want to know what they have been up to? You can follow other players to look at their season, match stats and recent matches. Speaking of playing with your friends... you can set up a custom scoreboard that let's you compare up to 4 players in the last 1 - 5 matches. If you duo or squad with the same crew it's a great way to see who's carrying the group. Sometimes you don't have access to a desktop, laptop or tablet. That's no problem. PUBG Lookup is a responsive web app which means no matter what screen size you're using it will look great. If you're like me, you have a laptop next to you while you play. 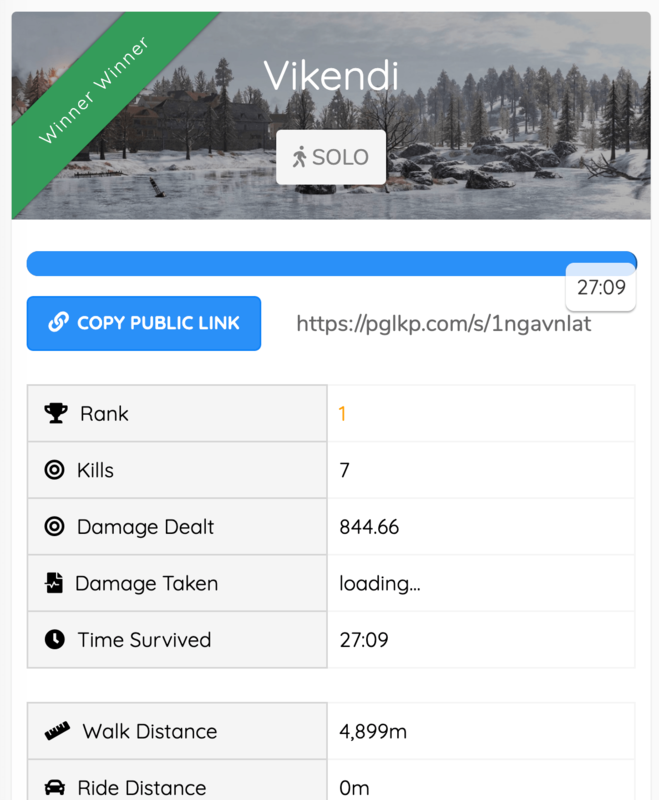 PUBG Lookup is a responsive web app. That means it's optimized for mobile devices, tablet devices and desktop sized screens. PUBG Lookup supports console and PC statistics. Want to follow your favorite PC streamer but still track your XBOX or PS4 stats? No problem. 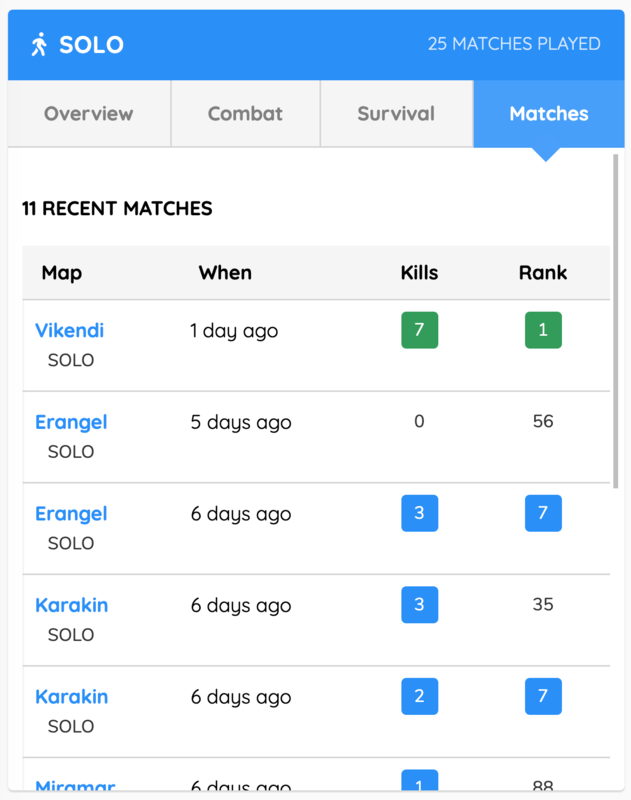 You can look up statistics for all players available through PUBG's API. Frequent updates to PUBG Lookup are made. Some of them are news worth and others aren't. You can read about all of them on the announcements page and on the PUBG Lookup Twitter page. A few times a month I'll send out some maintenance updates. A large update was sent out last night that improves performance and fixes a few bugs here and there. If you notice anything that doesn't look right please let me know know on Twitter, send a bug report or send an email to support@pubglookup.com. Have you ever thought to yourself "I see that same player in a lot of my games...". Now you can see who you play with and against the most. On your Account Dashboard you'll see a new panel for "Roster Frequency". This panel will show you the 10 most frequent players from the last 20 matches played. Stream snipers... we see you. Have you ever wanted to know how many times you've played against somebody recently? You can now search for players in the rosters of your last 50 matches. Check our your Player Dashboard to search recent matches. You'll get a list of matches that you've shared with that player, their upper-level stats, and a link to the match report. As always, feedback is welcome. Good luck out there and be kind to each other! A user emailed a suggestion for the ability to see your average damage over a length of time. This way you can get an idea of how you're progressing from a damage standpoint. That was a great idea so I took a stab at it. This is the first version of the feature and I would love to hear your feedback. By default the new home page is your Account Dashboard. This page is intended to give you an overview of your player stats and some new information like recent teammates and player rankings. You can see averages for your last 10 games, what maps you've been playing and a direct link to your last 10 matches. Another part of this update is you can now see your player rank, rank title, and rank icon. This update goes to all season stats panels. I use pubg lookup more than reddit.